Tobacco companies in the late 1800s were recognizing advertising as a critical element in the sale of their product. Then, with the introduction of the automatic wrapping machines, it was found that pieces of cardboard were required to stiffen the packages. 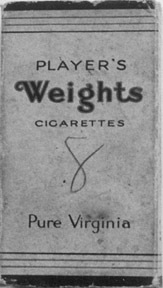 Since there were so many cigarette companies competing for market share in the late 1800s, several began to place ads and other material on those pieces of cardboard. In the late 1870s the first cigarette cards appeared in the United States. In about 1888 British companies began to issue various types of cigarette cards to entice customers to buy their products. Through the years, cigarette cards have been issued by the millions in the United States, Great Britain, Canada and Germany. The first cards focused on mainly male topics. There were boxers, golfers, Wild West cards and many patriotic types of military cards. 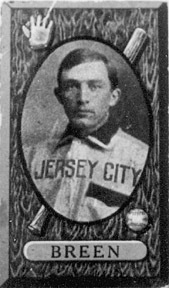 In the United States at the turn of the century and into the early 20th century, baseball cards were issued in tobacco products. Today we connect baseball cards with candy or gum, but the first ones were released in cigarette packages. During World War I, cards depicting war scenes, naval ships and battles were popular. Ads put out by the tobacco companies advertised that "one could keep track of the action " through the cards. The Sweet Corporal cigarettes produced a large, 250-card World War I set. There were two new cards issued every day to encourage individuals to smoke more. When World War I ended, there was a change in the marketing and type of card sets. "Ladies" were not supposed to smoke prior to the war, but with women working in factories and at the front during World War I, smoking by women was not frowned on any longer. Card sets began focusing on topics of interest to woman. Sets included "Flowers", "Cats" "Love Scenes from Famous Movies," "Needlecraft," "Modern Dance Steps," "Birds" and "Your Birthday Tells Your Fortune." For men there were auto racing sets and boxing sets, and aviation sets began to become big among collectors. But the 1920s was a time of "gentler" card sets. The Great War and its massive toll on human life made the general public want to escape, and the card sets reflected that. Artwork rather than photography was employed for many sets. Famous: artists' work appear on several sets. Arthur Wardle, famous for his hunting dog paintings, and Peter Scott, the wildlife painter, were employed to produce cigarette cards. That the decade of the '20s was a much gentler time was reflected not only in themes of the cards, but in the material that was employed to make them. To increase sales to females, cigarette cards were made of material rather than cardboard to entice women to purchase products. Thus, the 1920s became known as the Age of Silks. Among men, the big seller were the products that contained boxing and auto racing sets. Singleton & Cole Ltd. of Great Britain produced a set called "Famous Boxers." There were 35 cards in the complete set; #31 was Jack Dempsey. The front featured a fighting history and the back a brief history of the boxer's career. Also at the bottom of the card was an ad for the cigarette company. One of the most interesting sets of the 1920s was distributed by the Record Cigarette Co. of London. It was a series of 25 record cards, to be played on your gramophone. Each record featured variety entertainers and the series was billed as the "Talkie" cigarette card set. As the 1930s moved on, the focus shifted to aircraft. 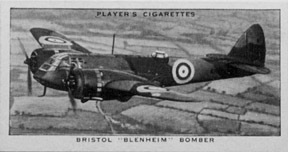 Many sets, including "Aircraft of the Royal Air Force" were offered. The RAF set was issued by John Player & Sons. 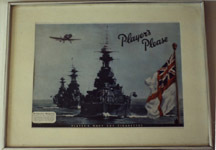 Patriotic card sets and military sets featuring ships and aircraft were reintroduced during this period. Practical cards were also issued with instructions for building bomb shelters and putting on gas masks. The end of the 1930s brought World War II, when millions of cards were donated to paper drives, to be used for the war effort. Another collectible connected to card sets is the album, which featured places to display the different card sets. 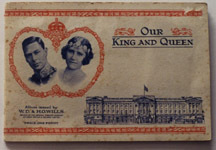 Many companies offered a commemorative album for an extra penny or two. 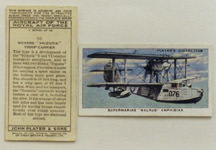 The "Aircraft of the Royal Air Force" set advertised on the back that the cards were made to be glued into an album. In fact, the surface of the cards were adhesive, which reminded collectors to ask about the album. The cigarette card sizes varied, but the standard size is about 2-1/4" x 1-1/4". Some sizes are smaller and some are larger. Most cards are still affordable; with all the different sets, collecting them can be a never ending adventure. Card from 1912, International Baseball card set made by Imperial Tobacco Co. Montreal, Quebec. Set of 90 cards. The American Card Cataloug. The standard guide on all collected cards and their values. J.R. Burdick. Nostalgia Press. The Complete Catalogue of British Cigarette Cards by The London Cigarette Card Co. The Catalogue of International Cigarette Cards by The London Cigarette Card Co.
Murray's Cigarette Card Values. Murray Cards International, 51 Watford Way, Hendon Central, London, England NW4 3JH. The Guide to Cigarette Card Collecting. Albert's of Kensington, 110 Campden Hill Road, London W87 AR, England. The Sport Americana Price Guide to N on-Sport Cards by Beckett Publications, Dallas, Texas. Condition is very important. Since the cards are paper, be sure your purchase has good color and cards are not torn or bent. Try to pick and collect a certain set. Since thousands of different sets were produced, just buying large batches of cards may not make a good collection. Think about what you are interested in. If just interested in cards for investment purposes, remember that prices move down as well as up. Gather as much information on cartophily as you can before starting out.